Still employing myself studying the (historical) crazy. 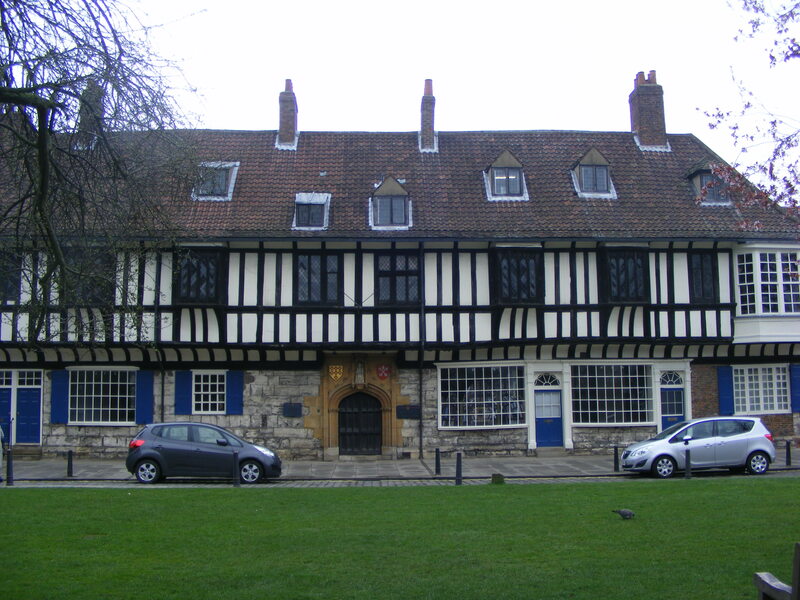 Digging around in some York archives, last week. For an upcoming article in a genealogy magazine about crafts and eighteenth/nineteenth century insanity. Here are some snippets I thought might interest readers, but I can’t shoehorn into the piece ~ some more fascinating reasons for inmates being “a fit object for confinement in a House for the reception of Lunatics”. [The Retreat, Register of Certificates, 1796-1819]. Huddersfield, yesterday. And having an hour to kill, I found the Local History section of the Library. I didn’t have time to look for my Huddersfield ancestors, wool weavers and dyers the Smiths, Dawsons and Listers ~ but did find this info I wanted to share, in a fascinating book, ‘The Water-Spinners’, by Chris Aspin, (Helmshire Local History Society, 2003). 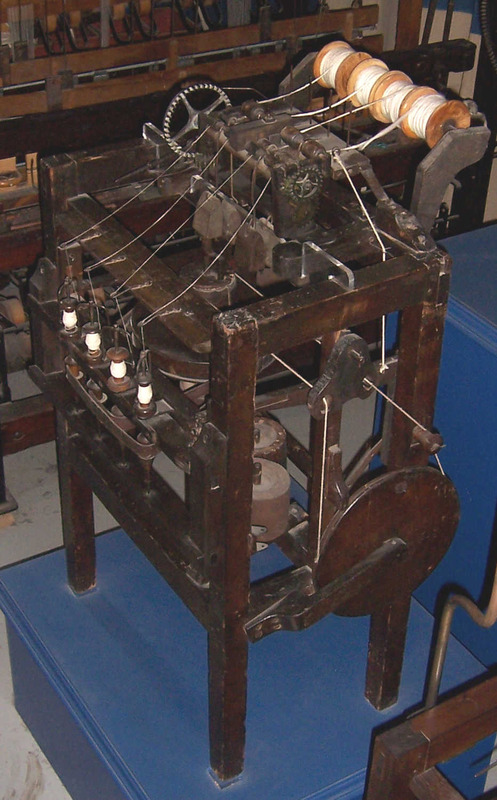 The book discusses the textile industry’s widespread adoption of Arkwright’s Water Frame, and why and how it overtook the older invention, Hargreaves’ Spinning Jenny. We all know about handspinners spinning “too thick”. But what about those who spin “too thin”? Ie: Spinning “beyond the (Bradford) Count” ~ which is apparently, something some contemporary spinners feel they should aim for. Yet it is a pointless exercise. Anyone who is routinely spinning beyond Count would, in any case, be spinning cheese-wire and failing to understand how to harness the characteristics of a given wool. For one thing, Bradford Counts were intended for measuring the grist (thickness) of worsted, not woollen yarn – yet spinning so fine the spinner goes beyond Count is something mentioned in the context of woollen spinning, as well as worsted. For another – the Counts were only a guideline, and deliberately spinning below them was, to our ancestors, the hallmark of a poor spinner. As Mabel Ross remarks in her ‘Encyclopedia of Handspinning’, the Counts were rarely spun to, in industry. They were a broad indication of the fineness of the wool’s staple, and as such, a hint how fine to spin the wool. Ignoring the Count by going beyond it, is a failure to understand the nature of your raw material. But there was another reason cited, for poor spinning. And although the source here is discussing Midlands manufacturers, it would be equally true for our West Riding wool spinners, bearing in mind that spinning was, most definitely, fitted in around agricultural labour and household chores. West Riding clothiers had to wait on handspinners less in the winter months, when they had more time to spin, according to various sources. (See booklist here). Arkwright’s Water Frame spun a superior yarn to the Jenny – finally a machine was able to spin a yarn that could compete with a Great Wheel spun wool warp although, as we have seen, it took another thirty years or so to thoroughly oust the Great Wheel from farms and cottages. Arkwright’s Water Frame was pre-eminent by the 1780s and manufacturers could begin to rely on wool spun more consistently than by the handspinner or the jenny. And one thing they wanted to eliminate was… wool spun “beyond Count”. 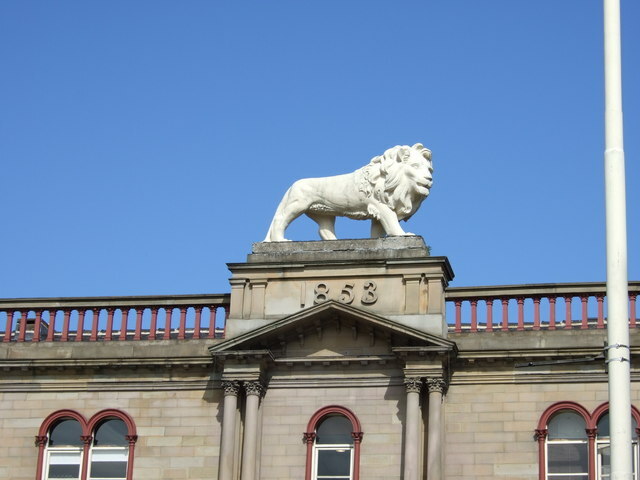 Will be back in Huddersfield next month and this time for a day in the Archives. Knit Like a Victorian Lady! (Or Gent). Ever wanted to know how the writers went about researching and writing ‘The Old Hand Knitters of the Dales’? Or do you want to know more about ‘the terrible knitters of Dent’? How people knitted at commercial speeds in the eighteenth and nineteenth centuries, in the Yorkshire Dales? And what did they knit? What is ‘swaving’? Who were the hand knitters of the Dales? Wonder no more. I’ll be ‘doing a talk’ about The Old Hand Knitters of the Dales on both Saturday 5th and Sunday 6th April at the Yorkshire Farming Museum. Time: 10 30 to 12 00 am. Price: £10 including museum entry. If you’re interested in attending the talk, either day – just turn up. I will go on (and show you pictures and actual Things) for some of the time, and then you can throw questions at me. April 5th and 6th is the 2014 opening weekend at the museum, and my talks/workshops are just a small part of Murton Park’s Country Crafts weekend. So there will be other things to see and do at the Farming Museum on the day! There are still just a few places left on the afternoon workshops, both days, ‘Knitting The Old Dales Way’. A rare opportunity to learn how to knit with a knitting stick. Details here. 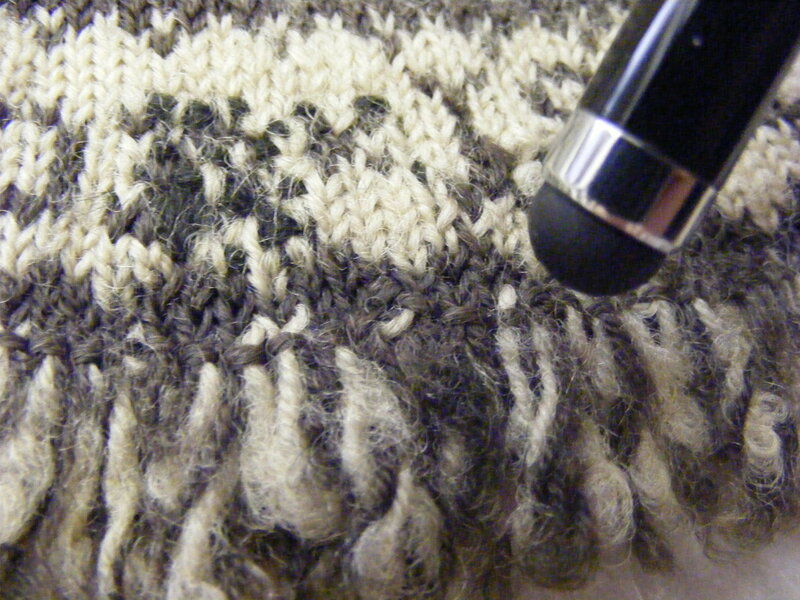 The workshop (same both days) is to teach and practice the dying Yorkshire art, knitting with a knitting stick. I will also go into more detail about the other paraphernalia Dales knitters used. If you’d like to book a workshop place, email penelopehemingway@gmail.com and I’ll pencil you in. 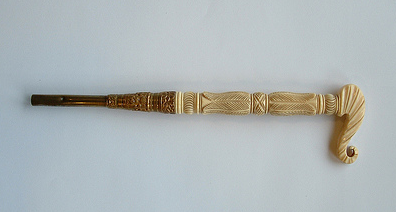 Image courtesy Dales Countryside Museum (stick from Marie Hartley’s personal collection). 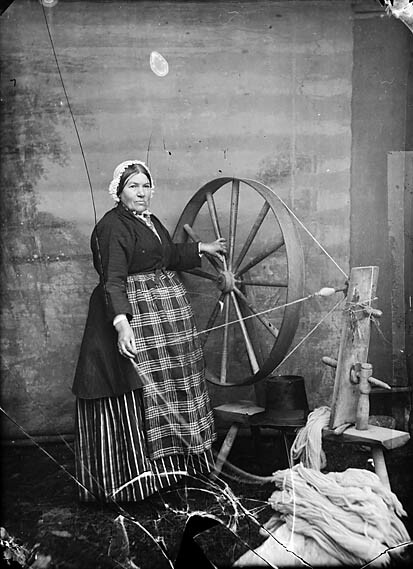 Woman At Spinning Wheel, The source of this file is http://www.llgc.org.uk. National Library of Wales. NB: Looks like this image has been reversed! I’ve hesitated about writing this post. In the same way I hesitate about commenting on YouTube videos that claim to be showing a certain spinning technique – and aren’t. But great wheels are one of my ‘things’. And I couldn’t bear to see inaccuracies stand as ‘facts’. So in the spirit of preserving this craft (only a handful of British spinners can great wheel spin)… and after some thought, I decided I’d like to examine the historical ‘facts’ about great wheels, found on a blog. For no other reason than the internet can perpetuate some extreme inaccuracies, and opinions stated as ‘fact’ can confuse the unwary. Just as there is Bad Science in the world, there is Bad History. History not backed up by sources, or hard facts. What we’d like to believe was logical or right for the past, as most re-enactors/living historians know, is not what we should believe. NB: To ‘get’ this post you need to know that there were two types of spinning wheel. The first, invented in medieval times, was ‘the great wheel’ – a simple spindle mounted sideways, driven by a huge wheel. This was faster than the older method of spinning with a hand-spindle. 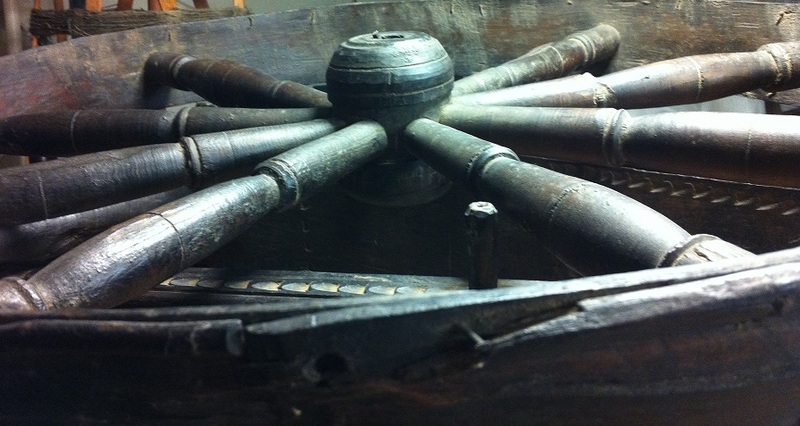 Then, around the 16thC, the flyer wheel – a smaller wheel the spinner could sit at. The wheel was now driven by a treadle, freeing both hands for the spinner to work. It also evolved a ‘flyer’ – the wool now automatically wound on a bobbin. These two types of wheel continued to co-exist but evidence suggests the great wheel never died out because it was faster and more efficient at spinning some yarns. Meanwhile, the little flyer wheel was better for spinning flax because you need two hands for that and it is slower than spinning wool. One reason I want to do this is that sometimes ‘bad history’ can lead us to the motherlode. By teasing apart misconceptions, we can get to the truth. And I guess what I really want to do here, is to go on about great wheels and why this medieval invention did something wonderful and unaccountable – surviving first the flyer wheel’s introduction, and later, machine spinning. As the great wheel co-existed with both – the flyer wheel for hundreds of years and the spinning mule by decades. I’m always amazed, reading about the history of spinning, we aren’t more taken by this particular miracle. So, to The Blog. Let’s see what we can learn. Apparently, according to The Blog, there are a “significant number” of flyer wheels with “accelerators”. Are there? Where? What do you mean by ‘accelerator’? I’ve seen more ‘old’ spinning wheels than I can shake a stick at. But never seen one with an ‘accelerator’, let alone ‘significant numbers’ with accelerators. I’m not even sure what is meant here, by ‘accelerator’. When there were large numbers of professional spinners and hand spinning was a competitive industry, they knew about accelerators to allow them to spin faster. Did they? Where’s the proof? Why don’t they exist in museums or on the old wheels many of us own? How do you know what people in the past ‘knew’? And if they knew this – why don’t we see any evidence of them doing this? The romantic, rather fetching, concept of ‘professional spinners’ betrays a lack of understanding of how the system worked. If you’re talking about the UK, anyway. Spinners in the eighteenth and nineteenth centuries, in the West Riding at least, did more than just spin. At halfpence per pound spun and, at best, a pound spun per day – there was little incentive to become Britain’s Next Top Spinster. Spinners’ wages were so low, they would often decamp to the fields – being an agricultural labourer, generally the poorest of the poor, was still better paid than spinning. Clothiers, or their agents, might travel considerable distances to find their spinners. Writing in the 1850s, John James interviewed an elderly Otley (Yorkshire) clothier who recalled employing spinners as far afield as Cheshire and North Derbyshire. William Jennings, an “aged manufacturer” recalled finding his handspinners “twenty or thirty miles distant” (James, p.325). In the age of handspinning, spinners were hard to find, and in demand. Yet being ‘in demand’ in a capitalist system, does not always translate into being ‘well paid’. Spinning was not a skilled job or a ‘mystery’ and you didn’t have to pay a years’ wages for three years for an apprenticeship to learn it. So it was undervalued. The late 18thC even saw spinners’ wages dropping, at times and there were points, throughout history, where the later spinner was paid precisely the same per day as the medieval spinner had been. Clothiers accepted sub-standard yarn – and wove with it. Spinners were not paid extra for excellence. There was little or no incentive to be the ‘best’ spinner for a clothier. To think it was ‘competitive’ is very romantic. But untrue. The work was largely carried off by the female members of the family or by the children… Around the spinning wheel has centred the Arcadian conception of eighteenth-century bliss; but like most popular opinions of the charms of ‘the good old times’, it must be taken with a great deal of caution…. Rough and ready original repair on a great wheel’s rim. In various sources, clothiers are always bemoaning the quality of handspun (see book list below). Most warp chains were made from a random mix of the work of at least ten spinners. The concept of there having been any one perfect, wonderful, ‘professional’ spinner providing an entire warp or weft for any one clothier, is ridiculous. Does this sound like “a competitive industry”? 16 hanks per pound would be one 560 yard hank of 1 ounce weight. This is coarsely spun yarn. Not the superfines mentioned in the blog as standard. 24s would be pretty fat yarn, too! …they knew about accelerators … They did not put them on great wheels. I think you’ll find they did put them on great wheels. The Blogger appears to believe accelerators were made for flyer wheels. The original patent may be lost, but anyone who has seen or used one, knows it can only attach to a spindle wheel. 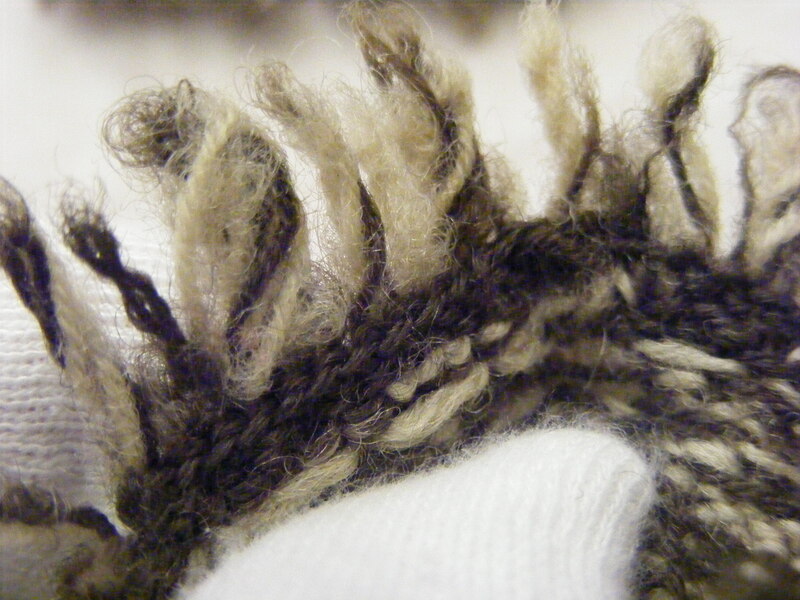 Minor’s Head, image courtesy “Lynne-marie”, from Ravelry ‘Spindle Wheels’ group. Minor’s Heads were put on great wheels in their thousands. In the US. Britain is a different story. 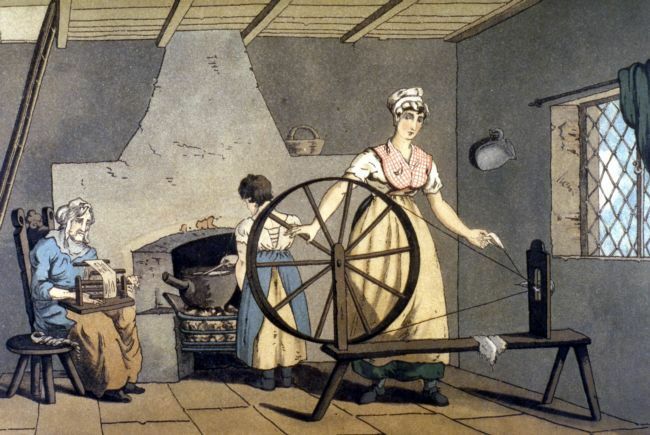 By 1810, handspinning was in its death throes in the UK. Cotton had been spun by machinery for decades, but it was not widely adopted for worsted spinning til the 1790s. Bradford only got its first mill to machine spin worsted as late as 1800. Spinning wheels – specifically great wheels – were still very, very common on farms and in houses all over Britain. But once the mills had perfected the process, the wheels fell slowly silent. When you must spin a great deal of fine worsted, it [a doctored flyer] is the tool of choice. It may well, but just because you can do it on a heavily doctored Ashford Traditional, doesn’t mean that MUST be how everyone did it in the past. And as we shall see, contemporaries believed the great wheel made a superior worsted warp thread as well as a superior lightly twisted woollen weft. Like other sources (See Heaton and James), Walker quotes the spinners’ “low wages of about one halfpenny per pound weight”. The constant mention of low wages for spinners also militates against our Blogger’s determination to prove that flyer wheels were the only way wool was spun for warps. Spinners bought their own machines, and had them at home not in manufactories. 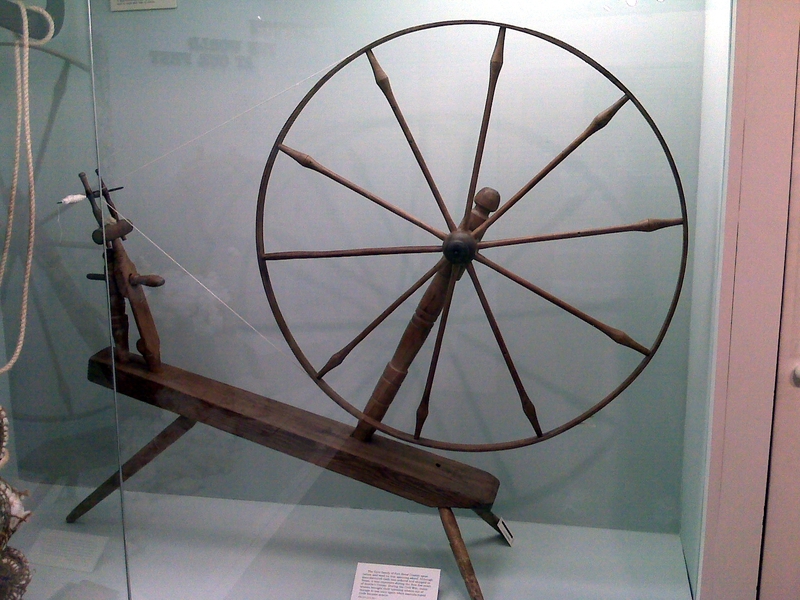 J.Geraint Jenkins wrote: “… Spinning was carried out on a great wheel, the value of which in the late eighteenth century varied between 1 shilling and 6 pence and 5 shillings…” Flax (flyer) wheels were more expensive, and seen as the province of the flax spinner or a toy for the middle class or wealthy. Great wheels were the Medieval technology of choice. The Renascence tool was the flyer, and the flyer was faster and more compact. Certainly great wheels were cheaper and deeply bedding in myth and romance, but as a tool for a professional spinner was the tool of choice. 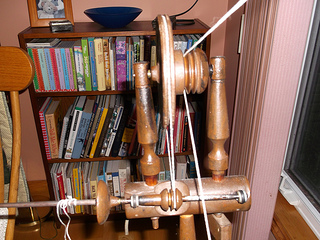 No great wheel can keep up with a flyer/bobbin wheel properly designed for the grist; not spinning worsted or woolen. Ah. Where to start with this lot? Let’s look at what people who were contemporary to both great and flyer wheels being in use had to say. Our Blogger would have us believe the great wheel was on its way to becoming defunct after ‘The Renascence”. But the sources tell a different story. Traditionally, great wheels were seen as producing a superior woollen thread; flyer wheels more suitable for flax spinning, ‘hobby’ spinning of grand ladies who wanted a pretty wheel, or worsted spinning. Later, as we can see from George Walker’s words, the great wheel was also seen as spinning a superior worsted. Maybe because you can stand still once you’ve drafted back and keep putting as many twists per inch as you like into great wheel spun yarn. You can control the twist in ways flyer wheel spinners can only dream of. The great wheel was also called ‘the one-thread wheel’ ,amongst many other names. This distinguishing it from the double drive band of the flyer wheel. [Thomas Caesar, 1596, quoted in ‘Textiles and Materials of the Common Man and Woman 1580-1660’, Edited by Stuart Peachey, 2001, p8]. ‘The long wheel’ was a common name for the great wheel. Great wheels – not flyer wheels – remained firmly the weapon of choice in the West Riding, powerhouse of world wool production – right into the early nineteenth century; long outliving flyer wheels as a ‘serious’ tool in the industry and even co-existing with machine spinning for decades, before finally being subsumed. ‘Woman Spinning’. From ‘Costume of Yorkshire’. George Walker, 1814. The main advantage of the one-thread wheel evidently arose from its capability of producing a larger quantity of yarn. Spinning by this rude implement (still to be seen in very many farm houses in the north of England,) is thus described… But in the worsted business there was a peculiarity in yarn spun by this wheel which gave it a great advantage over mill spun yarn, namely, the thread was spun from the middle part of the sliver, thus drawing the wool out even and fine. The best spinners would, on this wheel, spin fine qualities of wool to as high counts as fifties, that is where they required fifty hanks, each five hundred and sixty yards in length, to a pound of yarn… (James, 337). This gives us parameters for the fineness of yarn, as well. From the low of 16s, (Bradford Count) quoted above, to the ‘high’ of mid 50s (generally the finest British wool was spun til the widespread introduction of merino from Germany and elsewhere in post Napoleonic times). ie: spinners were not spinning the frogs’ eyelashes our Blogger is so fond of – but realistically, spinning to count or far below it (fatter grist). Welsh spinners spinning ‘Abb’ yarn, would spin incredibly fat yarn. In other words – when spinning wheels were producing yarn for industry, the preferred wheel for all woollen yarns and often, a semi worsted warp – was the great wheel. Expertise in the flyer has been lost. A flyer will do a lot more than most spinners are aware. Tell that to every single authority on the history of the wool and worsted industries. And the eighteenth century spinners and clothiers too, whilst you’re at it. As they all seemed to think of the flyer wheel as (i) a flax wheel or (ii) a toy. Also, check out The Guild of Longdraw Spinners. An English sailor, illustration from Habiti Antichi e Moderni by Cesare Vecelli, 1600. I’ve been bowled over by the interest in the General Carleton hat – especially from 18thC living historians and re-enactors. (If you’d like the pattern, it is in Piecework, Jan/Feb 2014). But one question keeps coming up: how do you thrum? I thought I’d tackle this here on the blog. In the 17thC, English sailors seem to have worn knitted hats with allover thrums. 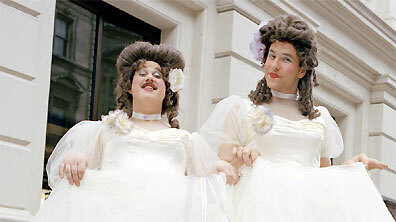 By the 1780s, the allover thrums are a distant memory – and seem to be confined to a decorative fringe. Similar fringes can be found on the earliest of knitted Dales gloves ~ the G. Walton gloves at The Wordsworth Trust in Grasmere, and also Marie Hartley illustrated a now-lost pair of fringe gloves, in ‘The Old Hand Knitters of the Dales’. There are two rounds of thrums on the General Carleton hat, as I knitted it. You make the thrums on rounds 2 and 4. I did the first round of thrums in the natural cream colour and the second in the natural dark. You can mix it up if you prefer! I was lucky to have access to another researcher’s photos of the inside of the hat. I haven’t permission so won’t reproduce the Carleton interior pictures here but what I can show you are our own photos of the G.Walton glove which appears to be thrum-fringed in a similar way. Even so, I am not confident we can say any one way of thrumming is ‘authentic’ for this – or any – period. Which frees you to thrum how works best for you. I could only see the hat in a display case and as museum exhibitions tend to be for everyone, not just knitters, knitted items are rarely inside out when on display. Which is a shame as it tells you a lot about construction methods from an inside out item! Another item with a fringed edge I have been able to examine, are one of the earliest pairs of Dales gloves, the ‘G Walton’ gloves – pattern soon to be published in ‘The Old Hand-Knitters of the Dales’. You can look at our reference photos of the Walton glove and decide how you think these 1846 thrums were made. The gloves are incredibly fragile and most of all at the fringed edge. Meantime, for those struggling with thrums, you can just knit the hat straight then ‘sew’ in lengths of yarn when it’s finished; secure how seems best to you. I will try and explain how I thrummed my version of the Carleton hat. The Yarn Harlot’s Thrum FAQ is pretty well the method I opted for. Only you’ll notice, as in Maine mittens, the Harlot is using unspun wool and the thrums are lying on the inside of the work. For our fringe, we want them on the outside. All you are doing, is knitting the 6″ length of yarn in with your next stitch, and then pulling both legs of the yarn to the outside of the work. You can do this in whatever way seems good to you. But I have tried to write down the way I did it, below, for anyone who needs to know. It is not the same way the 1846 knitter of the Walton gloves did their thrummed fringe. But it is a way that works. 1.Take the 6″ length of thrum, lay it alongside your working yarn, but line up the thrum’s centre at the point of the needles where you will be working. 2. This will leave one leg of the thrum on the exterior of the hat, but one, annoyingly, on the interior. Your mission is then to physically haul the second leg, (that wants to lie on the inside of the hat) out so it is also dangling down the front of the work alongside the other thrum. 3. So slip the thrum you just made to the left needle, and haul the second leg out to the front of the work. Once both legs of the yarn are dangling on the front of the work, slip back to right needle. You’re ready to make your next thrum. 4. On the next round, when you come to each stitch, knit it with its thrum like a K2tog. Tug each thrum to make sure the legs are level and it is secure. 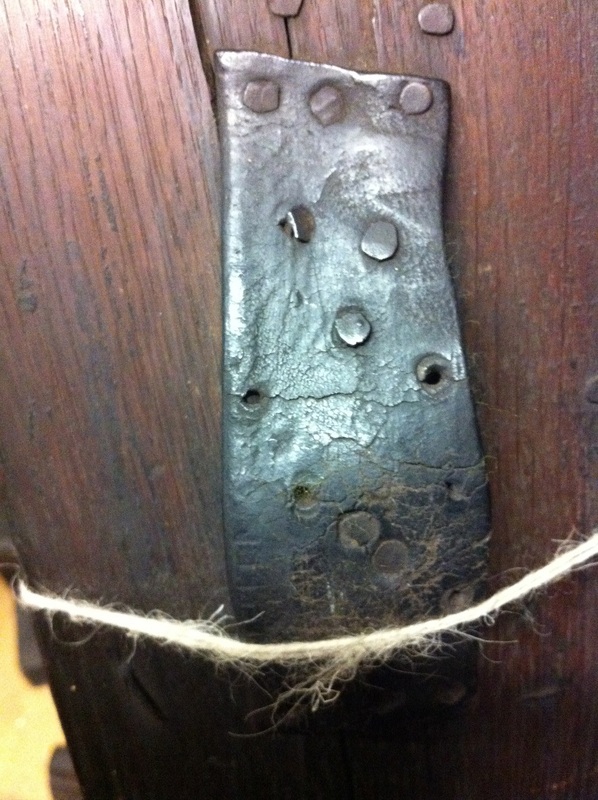 At the end of the round, you will have your original number of stitches, and the thrums will be secured. In Newfoundland and Maine mittens, the thrums are made from roving, not spun yarn like our’s, and the ends are dangling on the inside of the work, not the outside like our’s. However, you may find this video by Eunny Jang helpful. Although Eunny is folding the thrum in a more complicated way than you need to. All you need to do is fold your 6″ thrum in half, then work the thrum into your knitting at its centre point (3″ in), and unlike the Newfoundland and Maine thrums, you are eliminating the thrum on the next round, by knitting it together with its stitch – whereas the Newfoundland and Maine thrums have their thrum’s loop left in the work, its contrasting colour providing the pattern in the knitting. We’re essentially making an inside out thrum, in other words!